But even with cycle shorts I guess it’s the same as with every trend: just adapt it and stay true to your own style and everything will work out in the end. So I think that I do can make a promise (didn’t learn that much about promises huh): that I would never wear cycle shorts with a cropped top or bustier as the Kardashians would do. Instead, I prefer to style the cycling shorts with an oversized shirt and classy jacket. So what do you think of me adapting the cycle shorts trend and this combo? So thanks to Instagram for inspiring me once again and giving me so many new ideas how to style cycle shorts. It started with the laidback styling from Pernille Teisbaek. Apart from that, I’m loving the combinations with blouses, shirts and blazers as you might see from the inspo below. Like this, you will never take the risk of looking like going to the gym. 😉 And last but not least, we can also take the cycle shorts with us into fall. By combining an Oversize Sweatshirt or some heavy knit and sneakers or boots, you won’t freeze on some warm fall days and still look fashionable. So what do you think about the cycle shorts trend and the inspo above? Any outfit that you would totally wear or not wear? What is your final conclusion about cycle shorts – Go or NoGo? Thanks to Isa for the pictures. This post contains Affiliate Links. Such a beautiful look – this is gorgeous and I love how you’ve styled it! Beautiful! The bike shorts are SO cool with this, lady! This is such a fab look dear. 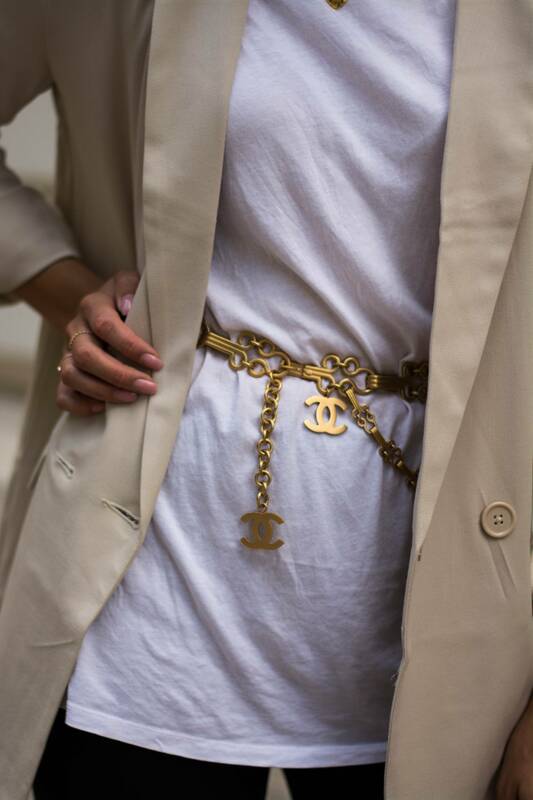 I love the blazer, and the gold belt pops out from beautifully. Such an elegant touch. I love that blazer! super cool look! 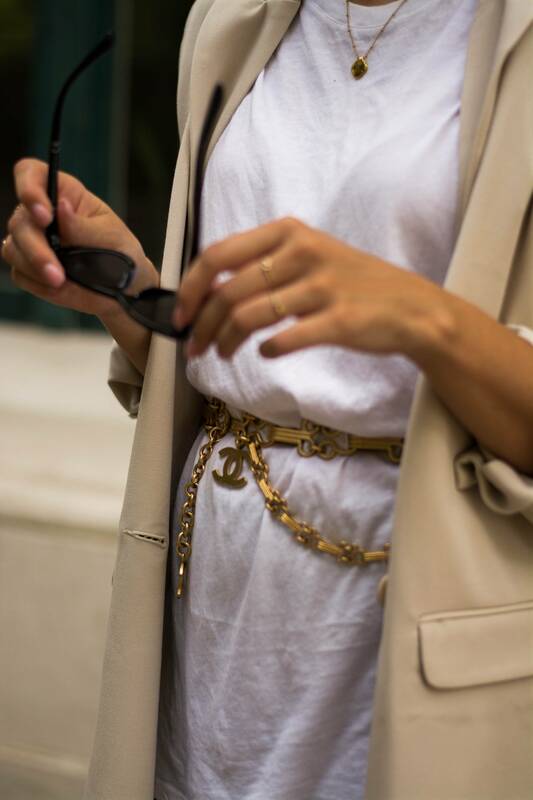 You look stunning and fab belt, the gold details is perfect. Bitte wie schafft man es Radlerhosen so stylish zu kombinieren? Ich zieh den Hut vor dir! Such fashion forward styling. I love the sport mixed w business. Der Post ist echt klasse geworden! Ich liebe es wie du die Radler Hose gestyled hast. Oh Tina, natürlich hast du die Radlerhosen perfekt gestylt – ich mag den Look super gerne. Besonders weil er etwas elegantes und sportliches hat. Auch die Looks von Pinterest gefallen mir alle sehr gut. Besonders Nummer 4 und 5 sehen top aus! Aber auch die Idee auf dem ersten Bild, das ganze "Business mäßig" zu stylen, finde ich klasse. das Outfit ist ein TRAUM :-* Der Blazer ist super schick !!! I love how effortless and stylish your looks are! I have been wanting to buy bicycle shorts but only because they look so comfy. Now I want to buy some because you make them look so stylish! I´m obsessed with your outfit:-)You look stunning! I’m with you on that one hun, never say never! Love the styling with the tee and the blazer.